In a couple of weeks’ time, fans of AltrOck Productions, the cutting-edge Italian label founded by Marcello Marinone and Francesco Zago in 2005, will be offered the unique opportunity to attend a two-day festival featuring a selection of exciting Italian and European bands, many of them have appeared on these pages. The event, scheduled to take place on the weekend of June 1-2 at La Casa di Alex, a cultural centre on the outskirts of Milan, will see a total of seven bands taking turns on the stage. The label’s subsection Fading Records, dedicated to bands and artists who revisit “traditional” prog modes with a modern attitude, will be represented by Ciccada (Greece), La Coscienza di Zeno and Ske (Italy), who will be joined by highly awaited Norwegian outfit Wobbler; while October Equus (Spain) and Humble Grumble (Belgium) will add some intriguing RIO/Avant spice to the proceedings. Bassist Pierre “W-Cheese” Wawrzyniak (of fellow AltrOckers Camembert) will join Ske on stage for their first-ever live performance: while La Coscienza di Zeno will premiere their forthcoming second album, titled Sensitività. 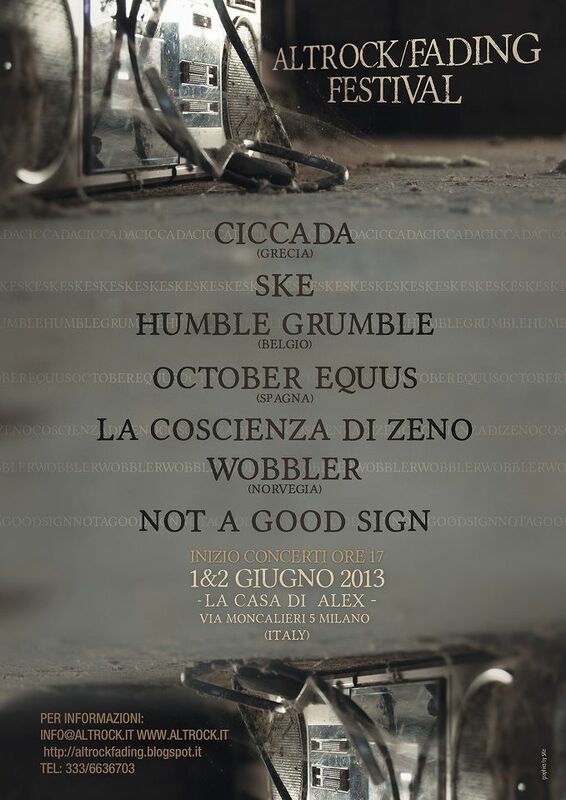 The festival will also mark the stage debut of Not A Good Sign, the newest offering from AltrOck and the label’s own “supergroup” of sorts, featuring Yugen’s Paolo “Ske” Botta (who is also the label’s main graphic artist) and Francesco Zago, and La Coscienza di Zeno’s Gabriele Guidi Colombi and Alessio Calandriello, as well as drummer Martino Malacrida. The band, who was started in 2011 by Botta and Zago (later joined by the other members), aims to revisit the sounds of classic prog – liberally seasoned with hard rock and psychedelic suggestions – with a thoroughly modern attitude, focusing on the creation of melancholy, haunting atmospheres. Their self-titled recording debut, officially released on June 10, will be available for purchase at the festival. Yugen’s Maurizio Fasoli (piano), cellist Bianca Fervidi and vocalist Sharon Fortnam (Cardiacs/North Sea Radio Orchestra) also guest on the album. You can listen to a preview of the album here.